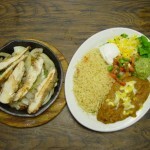 Casa Perico is a family-owned restaurant chain having a number of centers at Oklahoma City. The restaurant is functional since 1996. They specialize in serving Mexican Grille. The luncheon variety is available in both beef and mutton contents and is available from 11 in the morning to 4 at the evening. Apart from this, side dishes are also available, like Mexican rice, refried beans, borracho beans, ranchero beans, steamed corn, Mexican corn, grilled veggies; to mention a few. Among beverages, rocks or frozen Margaritas are highly preferred. Mexican beverages of bohemia, pacific, carta blanca, negra modelo are also very popular. There are currently 0 consumer reviews about Casa Perico available. Share your review. Please take a note that you are about to post a public review about Casa Perico corporate office on CorporateOffice.com. This review will be public, so please do not post any of your personal information on this website. If you would like to contact the corporate offices of Casa Perico, please use their contact information such as their phone number, website, and address listed above to contact them. However, sometimes staff from Casa Perico headquarters do read the reviews on this website.